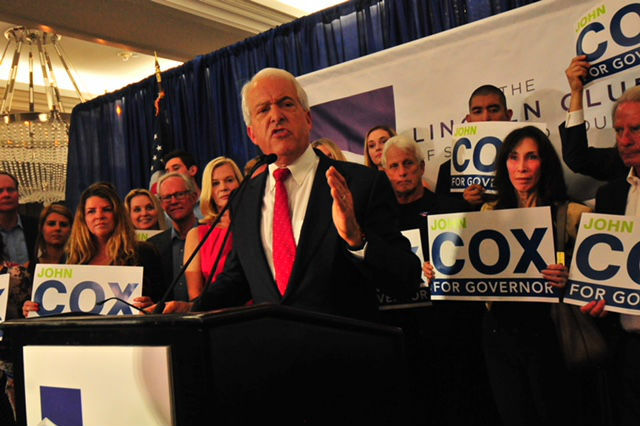 Republican gubernatorial candidate John Cox called on Gov. Jerry Brown to call a special session of the Legislature to approve an audit of the Department of Motor Vehicles. Cox, an Illinois businessman who now lives in Rancho Santa Fe, said Monday an audit of the DMV is needed because of long waiting times for service at its offices and errors in voting registration conducted by the department. “It’s time for Sacramento’s politicians to do their jobs and fix this,” Cox said. The Cox campaign also began airing its first radio commercial of the general election campaign Monday. The 60-second commercial titled “Struggle” consists of a woman explaining that her life “is a struggle and getting harder,” citing traffic congestion, crumbling roads, rising rents, the state’s poverty rate, the gasoline tax and car registration fee increase, long DMV lines, high food, gas and housing prices, poor schools and homelessness. California has the highest poverty rate among the 50 states when the cost of living is factored in, according to figures released by the Census Bureau. Cox faces Democrat Gavin Newsom, California’s Lieutenant Governor and a former San Francisco Mayor, in the November election.